Moving across the country or across the street is a huge hassle, but it doesn’t have to be expensive. Save time, stress, and most importantly, money, by getting rid of excess stuff first. The less you have to pack, the quicker and cheaper the entire move will be. Let alone the unpacking! So you’ll save money on both ends by lightening your load. 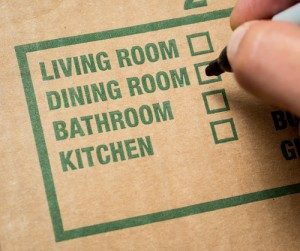 Use this list to help you comb through your home, instead of hiring someone to help you clean out your closets and storage spaces. 1. Time. Start getting rid of things months before you move so that you have the time to sort through what you will keep and what you will trash. It actually takes longer to get of stuff than it does to pack it! 2. Money. Plan to make money at a garage sale with your more valuable items. Clear out a space in your home or garage for items you’ll sell, so they don’t get mixed up with items for the trash or for donation. 3. Energy. Holding onto things takes up emotional energy (that’s why they call it baggage – it’s heavy!) Conversely, getting rid of things makes room for space in your life. Don’t believe me? Take a carload of stuff to Goodwill and tell me you don’t feel better afterwards. 4. Progress. You’ll be surprised how much progress you can make in just one hour a week. If your move is imminent, four hours a week. 13. Misc construction materials, like sheetrock, insulation, windows, plywood, etc. 32. Office supplies you are not going to use in the next two years. I have way more file folders than I’ll ever use because I repurpose old ones for new files by covering the label with a new label. 35. Old office furniture that you don’t use or that is uncomfortable. I offered a table to Freecycle (what is Freecycle?) that I considered barely useable and someone snapped it up! 36. Surplus clothes. Easier said than done. It helped me to go through my closet with my husband. He said “You have a lot of clothes that you’ve just told me you can’t wear.” Hahaha, now it’s silly, but it was hard to get rid of them! Here’s how to successfully sell clothes on eBay.